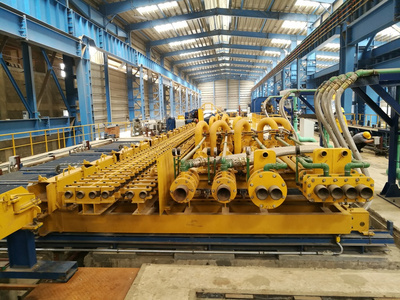 Primetals Technologies has received an order from Naveena Steel Mills (Private) Limited (Naveena Steel) to supply a continuous billet casting machine and a bar rolling mill for a new mini mill in Port Qasim, Karachi. The billet caster will be supplied by Concast (India) Ltd., a Primetals Technologies group company. The new mill will enable Naveena Steel to the enter the growing market for regional infrastructure projects. The mini mill will produce around 270,000 metric tons of reinforcing steel (rebars) per annum with diameters ranging from 8 to 40 millimeters. Diameters up to 12 millimeters will be rolled in multi-slit mode to improve productivity. As a special feature of the new plant, billets will be directly charged in hot condition to the rolling mill, which will provide significant energy savings. An inline induction furnace placed before the first rolling stand will serve to equalize the billet temperature, providing the seamless integration of the caster and rolling processes. Commissioning is scheduled to start in the second quarter of 2019.